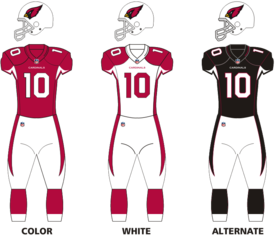 The 2012 Arizona Cardinals season was the franchise's 93rd season in the National Football League and the 25th in Arizona. After a surprising 4–0 start, the Cardinals lost eleven of their final twelve games, and missed the playoffs for a third consecutive season, resulting in the firing of head coach Ken Whisenhunt after six seasons. This was Rod Graves last season as General Manager of the Cardinals. A day after the final game of the regular season, he was fired after 16 seasons. The Cardinals began their season at home against their divisional rival Seahawks with QB John Skelton at the starting helm. The team started their season 1–0 despite Skelton finishing the game 14/28 for 149 yards and an interception. Kevin Kolb later on made a appearance in relief of Skelton going 6/8 for 66 yards and a touchdown pass. In a huge upset at Gillette Stadium, the Arizona Cardinals beat the New England Patriots and become 2–0. This was the Cardinals' first win against the Patriots since 1991. With the tough loss, the Cardinals fell to 4–2 and also with the Seahawks' win over the Patriots and the 49ers' loss to the Giants, the team remains in a tie for first place in the NFC West. With that loss, the Cardinals were not only eliminated from postseason contention and also falling to 4–9, but the 58-point loss was the worst in the Cardinals' franchise history. They had 8 turnovers, which was the most that the Cardinals have ever committed in a game. With this loss, the Cardinals surpassed the 1989 Chicago Bears for the worst record by an NFL team starting 4–0.